Becoming a parent doesn't change who you are all that much - not in the sense that you suddenly like completely different things - and you can let it change you as much as you want. Some parents seem to resist the parent label, pushing back on the expectations and stereotypes, at least when they talk to you. "Look, see! I'm the same care-free, good-time person I've ever been!" Other parents fully embrace their new role and can appear to evolve into a whole new person, one who's life centres on the little people in their lives. And they flourish, regardless of whether the people around them understand why they had to change at all. Becoming a mum or dad for the first time will change you on some level. It just has to. The full time responsibility of another human being isn't something you can really prepare for and the experience can shock and surprise you, in those early weeks and even years down the line. The love you feel. The frustration. The excitement. The restrictions. We all deal with them in our own way. I'm often surprised at how easy and how hard being a mum is. Day to day, we have our routine and we're all very happy. We do what we do, and Ethan is pretty laid back to let us. He's sociable, goes to bed most days without too much bother and sleeps through, and we can take him anywhere. Generally. And I feel almost smug. "Hey, this parenting malarkey is a breeze!". Then there's days - we all have them - where things don't go to plan. Where there's funny moods and bad weather to contend with. It suddenly dawns on me that I don't think I really know what I'm doing. When the nursery tell me that Ethan hasn't had the best day, and they look to me to have an answer for it. Or when people ask me if he's going to a school pre-school in September, and I haven't a clue how all this education stuff works - my only experience with it is from when I did it myself, and I had pigtails and the attention span of a four year old so how on earth would I have a clue what it was all about? Or when I took Ethan swimming last Sunday. We'd gone the week before and he loved it. So, we went to our leisure centre and first went to a play group for young people, but Ethan was not keen. He became suddenly clingy and even though he relaxed after 10 minutes, when I tried to leave, he wouldn't have any of it. We left and went to get changed to go in the pool early, meeting Daddy there shortly. And suddenly Ethan decided he didn't want to go. Whilst we were in the changing room. He said he did want to, then didn't, several times round. And I stood there, not sure what to do. I should be more firm with him, when he's like this; but then I also know that if I am, things can quickly escalate and just how will I deal with him? In the changing cubicle, I tried to reason with my upset-for-no-reason toddler. For about 15 minutes. And it felt like an age, because I was imagining what people the other side of the door must be thinking. 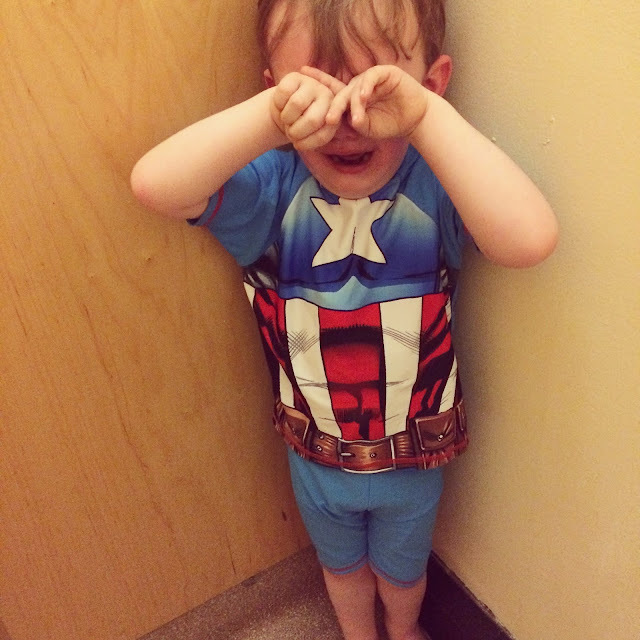 We managed to land on the decision he did want to go swimming after all and to do so he'd have to wear his new Captain America swimming costume (which he loved the week previous). I just kept thinking "please be ok now, don't throw a tantrum by the pool", as I honestly didn't know how I would handle it. I'm his mum. I know him better than anyone, alongside hubs of course. I can console him unlike no-one else. But still, I felt completely hapless and incapable of getting my little boy to listen to me. And it surprised me how all of a sudden, I didn't feel smug and like the best mum in the world. I felt clueless. Useless. Powerless. That's the seesaw of motherhood I guess. One minute, we're sailing through and everything is going our way. Next, we're thrown a curveball and feel out of our depth again. Whether it's with a baby, a toddler or a teenager. I honestly think I'll always be learning how to become mum. Trial and error. Highs and lows. Pride and falls. Perhaps the most surprising thing of all about becoming a mother is just how capable we are. Even if we don't feel it, we know that we are. Just look what we've accomplished! A living, breathing, independent little person! And wanting to be better, do more, get things right - it keeps us going. We can really surprise ourselves. 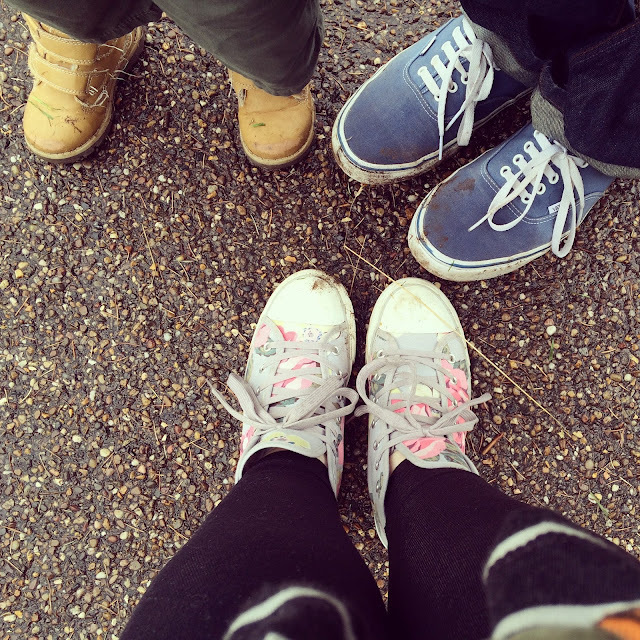 Such a cute picture of all the shoes.